Welcome to my second annual Halloween Horror Author Countdown. Every day this month I will be posting about a different horror author. But this year I'm gonna change it up a bit as I have a novel set to be released on October 30th, so ten of the days this month will be given over to the first ten chapters of Parasite (Shadows of the Past Part II), to give those of you unfamiliar with my writing a chance to read my work for free. Without further delay let's get started. First up is Harvey Click's The Bad Box. I read this in June and you owe it to yourself to take a look. Harvey Click earned an M.A. in English from Ohio State University, using his first novel as a master's thesis. 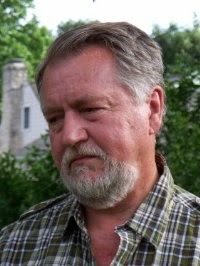 He has written five novels, four of them in the horror genre, and numerous short stories. He has taught English and creative writing for Ohio University, Ohio State University, the James Thurber House, and OSU's Creative Arts Program.